all 32 Ener-Chi Art prints individually. Lifting the Veil of Duality, which is ONLY available here, offered as a special gift with this NEW special compendium from Andreas. Please note that this book is specially packaged in a sturdy box designed with great care for safekeeping, and very suitable for gift giving. All of the proceeds from the sale of this special book, Art of Self-Healing, will be donated to the Andreas Moritz Light Trust, a non-profit foundation created in 2013 in honor of Andreas and his time-honored kindness, generosity of spirit, profound wisdom, far-reaching teachings and life-transforming insights that have helped countless people around the world. Recipients of assistance from the Andreas Moritz Light Trust, will be selected based on need, regardless of ethnicity, religion, race, geography, cultural background, gender or age. The goal of the Andreas Moritz Light Trust, is to provide meaningful, much-needed assistance to children around the world who have no parents – including nutritious food, healthy and safe living conditions, holistic education, compassionate care and enriching spiritual opportunities. Click here to find out more about making charitable donations. with 33 full color, activated pictures, 81 pages. 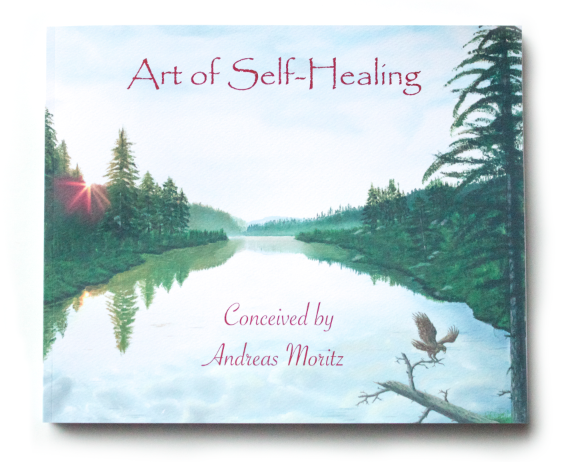 Art of Self-Healing, by bestselling author and internationally acclaimed health expert, Andreas Moritz, is a unique approach that gives you instant access to your own intrinsic, transformative healing abilities. Art of Self-Healing involves viewing a special collection of light-imbued, energized pictures – known as Ener-Chi Art ™ – created by Andreas over a period of 12 years. An additional six Ener-Chi Art pictures help balance the Chi flow between the body and the external environment, such as the air, water, rocks and mountains, plants, animals and nature beings (elementals). Beyond these are three others: one picture that helps restore emotional health, another designed to enhance one’s spiritual health, and a third to help us connect to our inter-dimensional beingness and potential, which is an essential prerequisite for effective healing and transformative shifts to take place. Eastern approaches to healing, such as acupuncture and shiatsu, are intended to enhance health and well-being by stimulating and balancing the flow of Chi throughout the body. When Chi moves unhindered, health and vitality are maintained. By contrast, if the flow of Chi is disrupted or impeded, health and vitality tend to diminish or deteriorate. Art of Self-Healing is designed to bring balance back to all aspects of life with ease and grace.